I decided to try something new this year on my front porch. Instead of always bringing the outside in, I’m bringing the inside….out! Use a console table to create a simple vignette with an old chippy window pane, pumpkins, wheat, dried hydrangeas and of course Mr. Crow watching guard. Want to see more of my Fall Front Porch? I’m sharing it over on the HGTV Gardens site today and I’d love for you to stop by and see more of my simple and inexpensive ideas for welcoming Fall to your front porch! 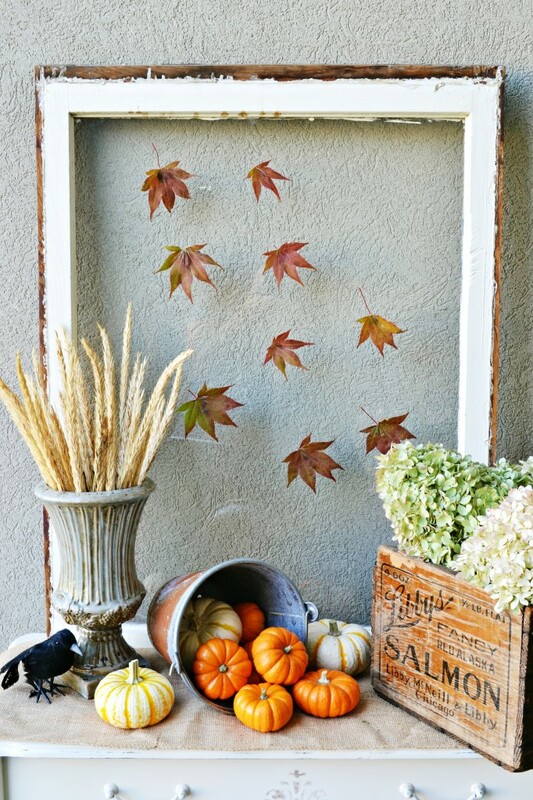 7 Comments on "Fall Front Porch Decorating"
Love love love…so pretty Vanessa! I so love the simplicity of the leaves on the window..and the great vignette…wonderful job Vanessa…will go over to the garden site! I love the leaves on the window. I have a vintage window hanging in a backyard area. You have inspired me to remove the cute little heart garland hanging there and replace it with leaves. Little changes make a big difference.